I got a bit creeped out in the water recently. It’s a rare enough occurrence that I can’t actually remember the last time. The sea is my home, not in Man From Atlantis way, but in a “it’s where I feel most in control” way. When I arrived at the Guillamene, my reguler training location in Waterford’s Tramore Bay, I noticed something, well, odd, out in the bay. The wind was light, a Force Two breeze, SSW direction, meaning the west side of the bay was sheltered and fairly flat and calm, nice for a change. The bay here on the south coast of Ireland faces south and the prevailing wind is south-west, with northerlies being offshore. Winds from the south-east are most rare, and cause the most difficulty, as they reverse the local currents, and can odd transient local effects. There was a long (maybe 1500 to 2000 metres) arc of rough water about 800 metres to a kilometre out from the shore. I’m used to seeing the usual local cold water current (The Scarf) out in the bay streaming inwards. The Scarf was also visible and this arc was around the same location, but different, as when The Scarf is visible it tends to be slightly differently-coloured than the water around it due to being more dense and it’s surface is flatter than the water around it, often giving an appearance like an oil-slick. Look at the video below though and this odd water is very clearly visible (select HD). The water I’m referring to is the dark grey arc. You can also see the lighter shades of the colder currents in the bay. As I swam out toward Newtown Head, which is 1200 metres from the Guillamene, about half way (600 metres) out I swam into a patch of very unusual water. The water temperature jumped what must have been a degree, changed colour completely to become yellow (yeah, like swimming ina giant dump of urine) and there were clumps of kelp and a lot of floating matter. It was so unusual I stopped to look but I couldn’t see. As I continued outward, I was swimming in and out of similar areas, one minute the water would be a cooler and clear green, next yellow, warmer and full of stuff. Local fisherman John Stubbs was hauling pots on Little Tern, his boat, under the cliffs just beyond Chair Cove, but before Newtown Head. I haven’t swum past John this year and we haven’t talked since about October, though I’ve seen him out, so I stopped for a chat. We only meet when I’m swimming and him fishing, we started talking after a few years of us going past each other. John said he had watched this weird rip approach his boat, pulling seaweed, and getting rougher, and commented how strange it was. This man spends even more time in Tramore Bay than I do, and between us we probably know the waters better than anyone else. As we talked his boat started getting dragged closer to the rocks by a suddenly-appearing current, so he had to put it in gear and move off. I swam to outside Oyen Rock below Newtown Head and stopped for a check. As I threaded water, I could see that I was being pushed west into Ronan’s Bay quite quickly. When I’d swum Ronan’s Bay only a few days previously on high tide the tidal current around Newtown Head was running the opposite direction and it took me 35 minutes to swim 800 metres toward Ilaunglas on the other side of Ronan’s Bay. For those of you who aren’t swimmers, 800 metres should take me about 12 to 13 minutes. I also know the currents across Ronan’s Bay are unpredictable enough that I allow for this, and it isn’t in itself unusual. Since I’d planned a longish swim, I figured swimming back against a current would be one way to pass some time, and if the current was bit too much work I had two alternative possibilities; swim out deep toward the horizon and around it, or head closer into the stacks and cliffs where the current would probably diminish. However as I swam across Ronan’s Bay, the current didn’t seem strong, and it weakened as I moved away west from Newtown Head. The water got colder and cleared up again. After I stopped at Ilaunglas to take some video, and started back, the adverse current was not too strong, only slowing me a bit. I realised this because I stopped to check progress. At that point I saw that the strange water was approaching from the east/Tramore Bay/South-east direction. Where I was swimming, the water was rippling but with a calm surface, a low Force Two water condition on a small swell. Only metres away and moving toward me the water surface was entirely different, like house paint stippled upward by a paint roller, all short sharp peaks and under the water again was yellow and full of matter. I filmed the transition. The confusing thing was there was no change in wind, which looking at the video. doesn’t sound right. When you look at the water surface, it looks like wind. 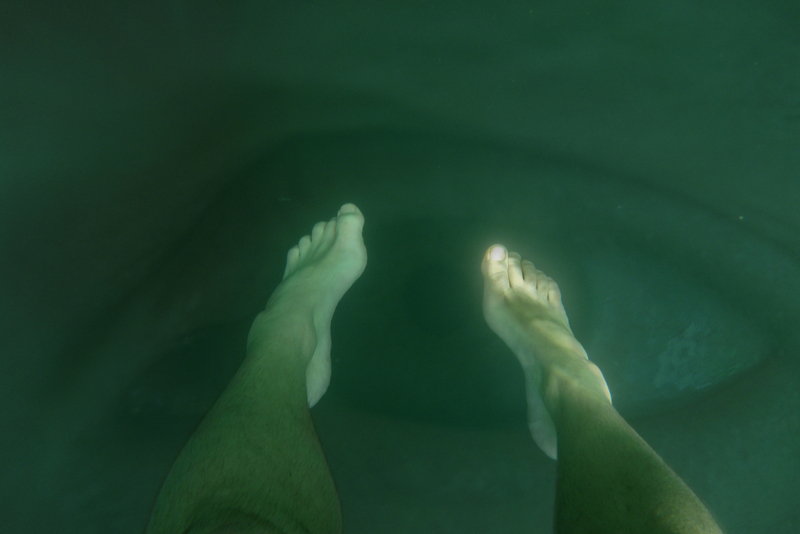 And thus I gave myself the creeps while swimming, imagining Leviathan moving beneath me, and I just a speck swimming above the world-eye of the beast. This is a favourite thing of mine to do while I am swimming. Others seek to mitigate or dismiss the fears, I like always to be swimming over the World’s Eye. It was a long way from Ilaunglas to Tramore beach and back out to the Guillamenes, over two hours. The water condition did not improve much but strangely, there wasn’t much current associated with this weird water. Had there have been, it might have been more explicable. 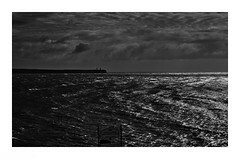 Back inside Tramore Bay was all choppy and it was only on the slog out from the beach, after swimming about six kilometres of a loop, that it abated somewhat. I passed John again almost two hours later, or more precisely, he passed me. But all this is not about the creeps. Or me getting the creeps, but that I don’t understand the water conditions, the very localized nature of the change without any apparent wind change. I’ve been at sea, particularly on a surf board or boat, when a localised wind squall appeared and it wasn’t such. It looked from the cliff and felt like some kind of narrow current moving into the bay and coast from the South East, but not driven by a local wind. I’ve never seen this before. Some years later and I’ve never seen it again. It’s not Creepy with a big C, more mysterious and unexplained ocean behaviour. Update: I met John Stubbs a few days later at the same place, low spring tide and I asked him if he’d ever seen anything like it before of it he knew what it was? He said in all hos years fishing (and he’s a full-time inshore fisherman) he though he’d seen something similar once. he said it looked to him (from the greater height vantage point) that it was an incoming current. Update 2. It’s three years later. Hundreds of more hours open water swimming in many locations. I’ve still never seen this repeated. Always be careful with the sea, it will surprise you. Very likely the same day looking down from the cliffs there were 3 swimmers in the water and approaching from the direction of the pier moving towards the exit/entry point of the Guillemene was what appeared to be a yellowish brown current that seemed to be churning. It looked like it was devouring the much calmer water and at least prompted me to say to my girlfriend I hope those guys are gonna be okay. Looked bloody strange from that vantage point and the swimmers seemed unaware. Weird to say the least! Thanks Sam, nice to have another perspective on it, certainly sounds like the same day. Thanks! Loved your writing here. I was with the story all the way, beautifully observed, thanks. Dear God, Donal. I was waiting for something to pop out – you had me terrified. It was like a horror movie. Hey Maura, the great thing was getting it on camera, to be able to share the weird and the beautiful was the reason for getting it and I was great it worked out for this.